Each year, the department awards several prizes, including the annual Warnock Prizes for Advanced Art Historical Writing, Art Historical Writing, and Outstanding Junior. The 2017-18 recipients are Sarayah Wright for Advanced Art Historical Writing, Luke Cimarusti for Art Historical Writing, and Kathryn Rothstein for Outstanding Junior. 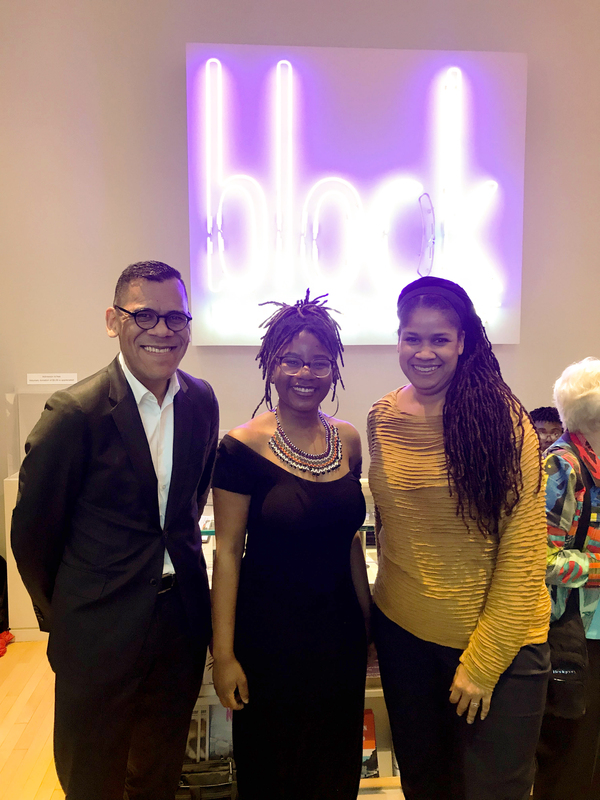 Above: 2017-18 Recipient of the Warnock Prize for Advanced Art Historical Writing (Sarayah Wright, middle, with Professor Escobar, left, and Professor Thompson, right). Claire Dillon, "Empty Space and Identity Politics in the Work of Félix González-Torres: Negation, Visual Rhyme, and Creative Reinterpretation"
Jasmine Jennings, "The Problem in Room 24: Racial Constructions and the Making of National Identity in the National Museum of Fine Arts of Argentina"
Matthew Kluk, "The Maison Cubiste: Modernist Fantasy and Bourgeois Reality"
Kristin Leasia, "The Emergence of Nurse and Guardian Images in Ancient Egyptian Royal Funerary Art: Some Connections to Dynasty 18 Pharaonic Legitimacy and the Hathor Cult"
Sophia Mancall-Bitel, "In Search of Los Angeles: Myths, Movies and Maps in the Work of Ed Ruscha"
Elliot Reichert, "Unretractable Social Marks: The Critical Spatial Practice of Street Art"
Jennifer Wong, "Reinventing the Ancient: the Transforming Female Figures of the Twentieth Century Painter Zhang Daqian"
Jessica Davidson, "Candidates for Admiration: Identity and Display in the Art of London's Public Parks, 1750 - 1800"
Viktoriya Kamara, "Extending Discourse on Soviet Art 1920's -1930's: The Career of Ekaterina Zernova"
Amanda Wasielewski, "From the Urban Dérive to the Internet Drive: Deterritorialized Capitalism in the Guise of a Digital Utopia"
Darrah Doyle, "HIV/AIDS Is Our Concern: An Examination of a Work by Artists of the Chivirika Self-Help Embroidery Project"
Lauren Wright, "Time-based to Time-bearing: Temporality in Recent Film and Video Art"
Alison Goldstein, "Dürer versus Raimondi: A Claim of Ownership"
David Peterson, "National Endowment for the Arts v. Karen Finley: Understanding U.S. Government Arts Funding Amidst Controversy, Political Warfare and Ideological Clashes"
Dana Atlagic, "Perpetuating Inequalities: A Look at Happenings Through Gendered Criticism"
Brook Crowley, "Compassionate Orientalism: Théodore Chassériau's Arab Horsemen Carrying away Their Dead, 1850"
Anju Shivaram,"'Imagined' Femininities: The Chinese Calendar Woman as National Symbol"
David Mullet, "Etats Secondaires in Czech Symbolist and Surrealist Art"